The first thing I do when planning a party is choose the theme. Obviously this sets the tone for the entire party, so it's a big decision. A lot of the time it's easy - if your child is a huge Sofia The First fan your decision is an easy one. Other times, it's not quite as easy - perhaps for a 1st birthday or for an adult or group. Here are the questions I ask myself to help choose a party theme. Have you ever been to a party that was nice, but nothing like the guest of honor? You know the one where the birthday boy loves Batman and Mom decided to go with a Mickey Mouse theme, or a baby shower for a fashionista with a sock monkey theme? I compare this to your hubby buying you a power drill for your birthday because it was what he wanted. It's important for the theme reflects the honorees interest and personality - the perfect compliment is for someone to say "This party was so (insert guest of honors name)!" Birthday, baby shower, team party - each of these can be fabulous parties, but you definitely would have a different theme for each one. For instance you may choose a Spa Day party for your fashionista friends birthday, but that's not such a great baby shower theme (but maybe a great gift for the future mommy). Be sure the theme is appropriate for the type of celebration. You're probably not going to host a swim party in the middle of winter. The time of year is something you need to consider when choosing your theme. Time of day is a consideration as well, if you are hosting your party in the morning or early afternoon you would have a more casual, laid back party - you will definitely want to host it in the evening if you want a more formal event. Want to have a Little Baker's party and let kids decorate cupcakes at home? You had better have a big kitchen. What if you live in an upstairs apartment? You can't really have a Carnival themed party with game booth's set up if you don't have a yard. It's so disappointing to get excited about a theme just to find out you don't have enough room to have it. Can you easily find decorations you will need? Can you find the food/ingredients to make sure the theme is cohesive throughout your party? You know yourself better than anyone - and this is a time you need to be honest. If you're a last minute person you had better pick a popular theme so that you can find what you need locally, lots of Etsy sellers have a week or more lead time before your item is mailed. If you are not a DIY person and you choose an obscure theme you can bust a budget pretty quickly shopping on the internet. If you are a regular Martha Stewart you should be in pretty good shape. After we know what type of party we will be deciding who to plan the party for. 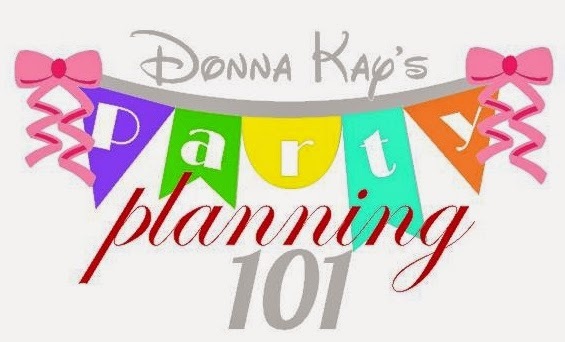 Be sure to tell your friends about Party Planning 101and the poll, I need your votes to get started planning our party! This is a fabulous idea! I wish I thought of it myself. Party planning can be so easy once you know the right steps. Can't wait to learn all of your tips. This will be fun! Looking forward to reading all your tips in Party Planning 101. Thanks Deb!! I am really excited!! Thanks Amy! We will actually choose our theme next week. Thanks Diane! I think this will be fun. Thank you for making this fun AND easy Donna!